A Leica Scanstation 2 on deck ready to laser scan sand castles as part of resolution experiments. What is art or science without a little experimentation? 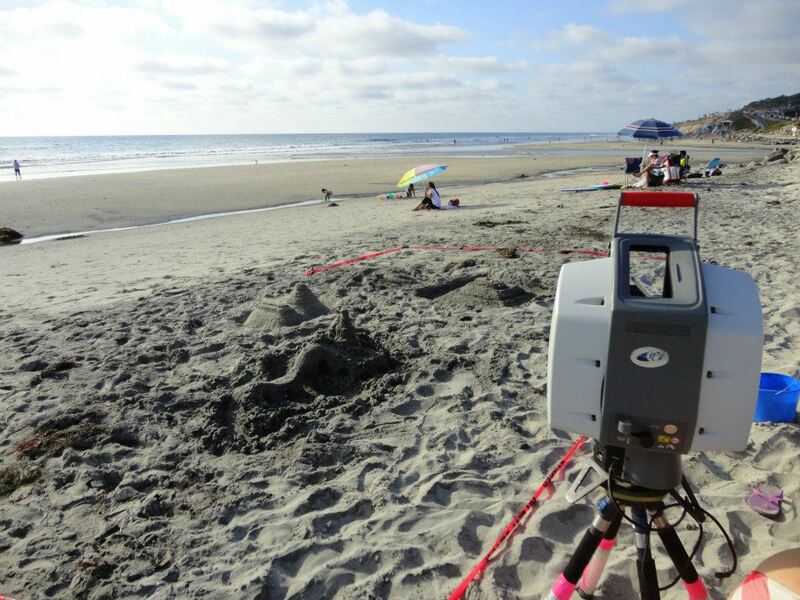 As a throwback to my favorite experiment in archaeological laser scanning and education outreach, our National Science Foundation funded Sandcastles for Science project on the beaches of San Diego (otherwise ponderously known as Sediment Intervals and Site De-Formation Processes: Exploring Time Lapse Laser Scanning Capabilities and Methodologies for Archaeology)–we’d like to have a a sand table in amongst our Cabinet of Curiosities. And we’d like this multi-colored sand table to be there to encourage visitors to build their own something. Be it castle, creature, or simple hole. And after the creation of each of these temporary artifacts, we’re going to image them. 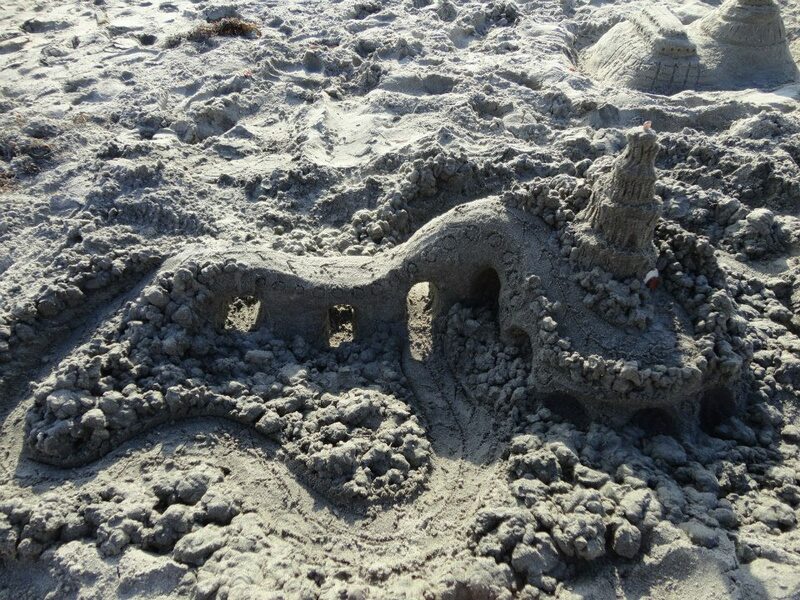 And while the very notion of a sandcastle reeks of impermanence, the resulting 3D model of each guest’s sand adventure will be a digital record of a typically fleeting event. The history of sand is a history of movement and of temporary constructs. Sand art is fleeting, sand castles will quickly be washed away by the tide. A digital sandcastles, like digital heritage as a whole, is a new oddity. It is a new way of looking at time and space from our contemporary point of view, and of knowing that someone in the future will likewise be able to look not just at time and space from their point of view, but filtered through an increasingly discernible lens of our modernity. Screenshot of sand castle point clouds collected via laser scanning during an Education Outreach day of Sandcastles for Science at Torrey Pines Beach, San Diego, California. In terms of conservation of all kinds of artifacts- be they fragile physical photos or robust brutalist architectural monuments–going digital adds layers of meta data and paradata to the artifact–and deeper chances for its scientific remembrance long after its remains have decayed. The resulting digital archive of swirling, whirling sandcastle point clouds created by guests at the exhibition will go on to become an art piece of its own for the future. To learn more about our original Sandcastles for Science experiment, check out the recap presentation on Slideshare and the paper that was inspired by it: Temporal Terrestrial Laser Scanning to Visualize the Archaeological Excavation Process, which details not just the initial experiment and the problems it uncovered, but the resulting development of visualization software to handle those temporal visual issues.